The piece you see is one of my favorite pieces I’ve ever created. In 2012, I heard Lamb of God, easily one of my favorite bands of all time, was coming to Philadelphia and were going to have a Meet-and-Greet before the show. I decided that since I couldn’t make it to the show I would at least get Lamb of God to sign something for me, so after some thought, I decided to just go ahead and do a gig poster JUST for them. Literally! I only made 3 copies: Two for me and one for them. The plan was to get two small ones, give them one, and one large version to get signed that I could put up on my wall. The tale of the piece itself is something else: I had the idea for years but never knew how to pull it off, until it finally clicked. But this isn’t about that, so you can read the history here. When I arrived at the FYE at Broad and Chestnut, I had run over from work which was just down the street, just 7 blocks away, and I was near the end of the line. I spoke to other awesome fans, met an awesome rep from Sony who took my photo with the poster, and I was getting really excited! Finally, the moment arrived and I got to meet the band, and, despite how many times I’ve met or worked with famous people or someone I admire, I still was starstruck! I wound up barely talking and just having a giant grin on my face! The band was incredibly nice, and they signed the new album, “Resolution”, for me along with the posters. They were all really thrilled with it and like it! That’s when I got to Randy Blythe, the front man for Lamb of God. He always stood tall to me… partly because he’s a good foot taller than me, but also because he has one hell of a voice! His personality shone through, and he loved the poster! He wound up taking a photo of it and putting it on his Twitter feed! Randy then turned to me and asked, “Hey, are you going to the show tonight?” “No, I can’t, I don’t have a ticket, but I really hope you have a great show tonight!” That’s when he turned to someone and handed me a piece of cloth. “Enjoy the show tonight, man, you earned it!” It was a pass to the show! I could hardly believe it! I wound up walking down the stairs from the meet-and-greet and out the door with a giant grin on my face! I couldn’t believe it! Not only did I get to meet one of my favorite bands, not only did they like my work, but I just got a free ticket to the show right from them! It was surreal, and like I could hear people calling my name. And they were. “LARRY!” I turned around, all the guys in Lamb of God were yelling my name… because I left my CD up there. I mentioned at least once how awesome it would be to actually get to do some design work for them, and who knows, maybe it’ll come true soon. 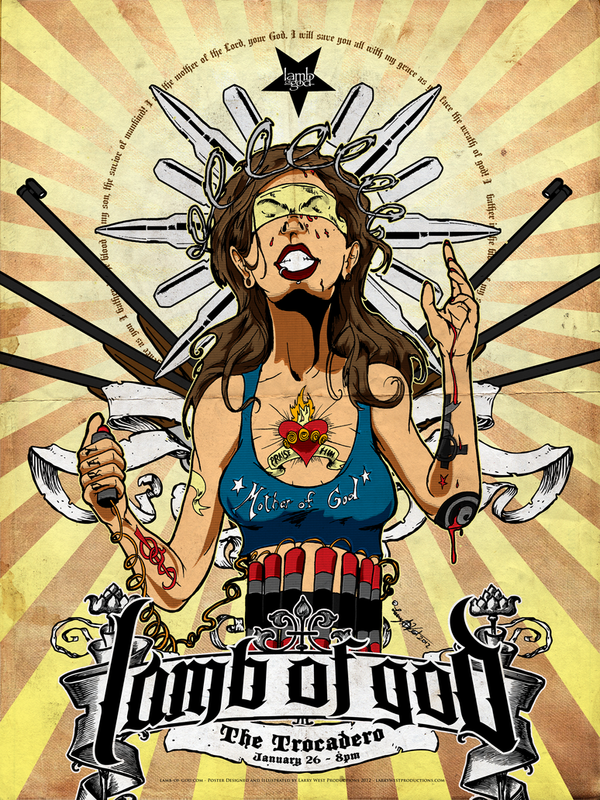 Gig poster for Lamb of God and In Flames for their show at The Electric Factory on November 24th in Philadelphia. This is the first in a series of 4 posters. Check out the piece on DeviantArt! Introducing BLACK LABEL – 25 Years in the Making! On top of that, I am pleased to basically announce a bunch of things at once! First off, I am pleased in ways you can’t even begin to imagine to announce the new “Black Label” line of products! “Black Label” has, in my life, always stood for quality and brilliance, and the best of the best! Also, I love the Lamb of God song “Black Label” as well. The Black Label emblem has been in the works for over 10 years, and I finally created the one I like the most and works the best. You can read all about the piece on Deviant Art. Next, I am pleased to announce that the new LARRY WEST PRODUCTION SHOP is now up and running! What is it, exactly? The purpose of the shop is to basically connect all the shops I own to on pipe-line that’s easy to navigate and highlight new products and lines that I have available! Zazzle, Cafepress, and Board Pusher are all here! Look for new partners, special offers, and original artwork and prints to come REALLY soon! Finally, I’m pleased to note that I am now officially old enough to run for either Mayor of City Council in Philadelphia. So corrupt and inefficient politicians beware! Next year could get interesting!